Can whales watch the humans who watch them? Miranda Jones is convinced they can and do. She’s looking forward to her day of whale-watching off California’s Central Coast. In preparation for a painting commission, she’ll be photographing the migrating gray whales. Yet even while the boat plies the coastal waters, she senses a presence below the waves, one that speaks to her heart. Miranda loves her new hometown Milford-Haven, set within the undiscovered beauty of California’s Central Coast. And she’s always wanted to explore the lovely mariners’ town Morro Bay, just a few miles south, where she enjoys meeting Captain Wallace, owner of the boat excursion company To-Morro-Today. The day-trip starts out peacefully enough. 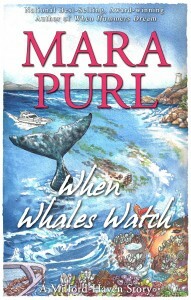 But the tables are turned when a whale of a different species turns out to be watching her. A rogue boat out of control . . . a rogue whale out of his normal location . . . what happens next will blow you right out of the water! Though the e-book stands alone, it also introduces Book 2 of the Milford-Haven Novels, the critically acclaimed, popular series, a multi-generational saga. Based on Purl’s BBC Radio drama Milford-Haven U.S.A.
Don’t miss the story before the story . . . the short story that happens right before Book Two, Where the Heart Lives.